Heat oven to 350°F. Spray large cookie sheet with cooking spray. Separate dough into 8 biscuits. Separate each biscuit into 2 layers; spread about 1/2 teaspoon preserves between layers, then put biscuits back together. Pinch edges together to seal. Cut biscuits in half. Place 2 halves on cookie sheet with round edges overlapping slightly to look like butterfly; press together where round edges touch. Make 7 more butterfly biscuits. Spread remaining preserves on tops of biscuits; sprinkle each with orange peel and about 1/2 teaspoon sparkling sugar. Bake 12 to 15 minutes or until golden brown. Cool 5 minutes. Meanwhile, in small bowl, beat whipping cream until soft peaks form. Beat in 2 teaspoons sugar and the vanilla. 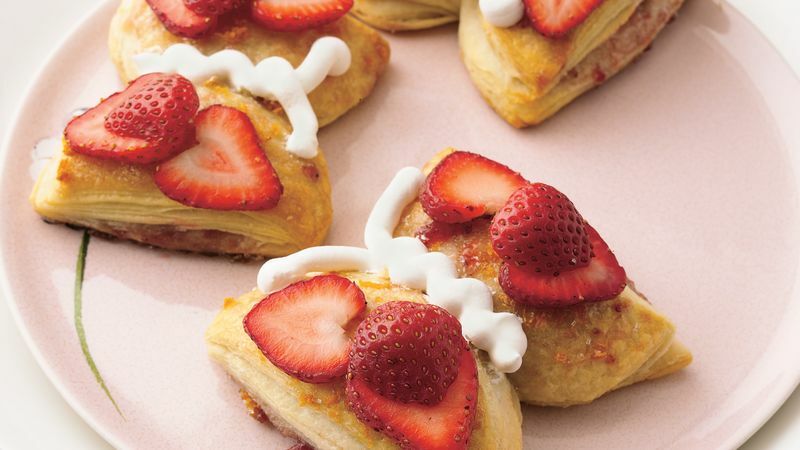 To serve, arrange strawberry slices on tops of butterfly biscuits for wings; pipe whipped cream to form body and antenna of each butterfly. Choose your favorite flavor of preserves to layer in these biscuits. Regular sugar can be substituted for the sparkling sugar.